Email marketing is more than just a fad. On average, most of us receive about 2.5 promotional emails every other week. Considering the fact that more than 294 billion emails are sent on a daily basis, it’s understandable why emails are a big thing. Before the advent of social media, email was everything. Despite what naysayers expected after the social media frenzy began, email is still embraced by billions around the world. 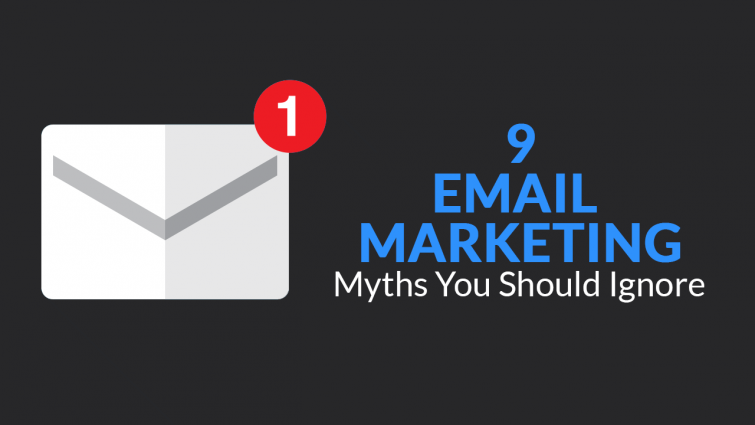 Remarkably, there is an overabundance of email marketing myths out there. As a marketer, you need to be wary of trusting and believing in what everyone else says about the dynamics of the field. What works for you may not necessarily work for others. In a bid to demystify perceptions and discern the truth about email marketing, we’ve analyzed 9 email marketing myths. We’re certain this info will be helpful and give you a lay of the land. Nothing could be further from the truth. Email marketing typically involves a consensual agreement between a marketer and a subscriber. For readers to receive promo content in their email feeds, they need to give permission beforehand. With the deal in place, marketers then plan their email marketing strategies using their lists. As you seek to explore the email marketing scene, you should be careful not to overindulge with templates. Personalization is at the heart of email marketing. Presenting readers with a hint of personalized content is a sure way to gain an avid following. Contrary to popular belief, unsubscribes are not the worst thing that can happen. As a marketer, you’ll need to fund your email marketing campaign with vast resources. Unsubscribes can thus be a blessing in disguise since they represent a fraction of individuals who could care less about what activities you are up to. By saving cash in this way, you can spend it on miscellaneous activities that can help you grow your email lists and get new followers. Amazingly, the subject line is not the most integral component of an email. A study conducted by Superoffice in 2017 stumbled upon an interesting revelation. Their surveys led them to the realization that the sender’s name was the most important factor in getting readers to open up emails. With this in mind, you should thus work hard at growing your brand to ensure that people associate your name with some value. While your content could be Pulitzer worthy, you won’t get new fans if your brand is not associated with the extraordinary. When handling new subscribers, you should ensure that their first 3-day experience is out of this world. Doing small things like drafting up welcome emails can go a long way towards a sale. In a bid to minimize the number of readers marking their emails as spam, many marketers wrongly assume that trigger words like “FREE” can have a debilitating effect on their campaigns. However, people generally have nothing against sweet offers. Whether you use cliché catchphrases is not really important. What most people really care about is the quality reflected in the content shared. If they are able to feel an intrinsic connection, your reputation will grow. Conversely, this means is that there less chance of your emails ending up in readers’ trash and spam filters. Email marketing myths are bad for business. When it comes to email marketing, “faking it till you make it” is allowed. While conventional wisdom is that you need to have numerous people in your list before sending out communication, there never really is an ideal moment to start your campaign. Establishing early contact with subscribers in your list helps to let them know about your brand and what they stand to gain. Having done that, you can then proceed to play the waiting game as you strategize. Alternatively, you can use this time to take a break from the office without having to worry about losing subscribers. Even with a tone of information sources at our disposal, you’ll be surprised to learn that attention spans are simply not what they used to be back in the day. In contemporary times, people are less likely to read lengthy posts/newsletters. Fully cognizant of this fact, you should try to break down information for your subscribers. Tiny nuggets of information are easier for readers to gobble. If you’re looking to make a long post, you should leverage the power of social media. Emails with light content are more likely to perform better than lengthy, crammed up emails. The assumption is that most people who work 9-5 jobs are usually away from tech devices over the weekend. While this may have been true at one point during the formative years of the internet, this is not the case today. There’s an increasing number of people having PDAs (personal digital assistants) on the go. With this in mind, you should feel free to up your email marketing game irrespective of the time of day and occasion. To ensure that your email is accessible by everyone, you should certify that all emails you send are mobile responsive in order to avoid losing subscribers. Irrespective of your position in the digital marketing scene, you should not compel readers to click a ton of hyperlinks. Instead, you should strive to draft up captivating content with a single call to action at the end. This strategy is effective because readers are less likely to become dazed on what the agenda is. A well-crafted CTA can direct users to perform specific actions and enhance conversion rates. By putting in real work on CTAs instead of links, your emails will have a more organic feel to them and will be serving a greater purpose than simple aesthetics. New businesses are often faced with the conundrum and temptation of fast growth. Growing your list in order to bump up your sales sounds like a perfectly reasonable idea on paper. In reality, it’s not. This is because buying up lists will lead to you having unsolicited subscribers who may put your reputation at risk due to spamming reports. In the worst-case scenario, you may end up being blacklisted and fined. As previously alluded, you should focus on growing an original and organic following. Having bots auto subscribe people to your lists is a façade that you should never get tricked into. It could end up saving you not just money, but time necessary to expand your business. Having highlighted a good number of email marketing myths and debunked them, we’re hoping you’ve picked up on a number of pointers. Email marketing remains to be an important skill to have. There are statistics to back up this assertion. Data shared by the Direct Marketing Association has shown that email marketing has an incredible ROI of over 3,800 percent. In their breakdown, they were able to show that about 72 percent of people mentioned that they are more open to receiving promotional materials through email than on their social media accounts. The numbers speak for themselves. As a marketer, it would be foolhardy for you to ignore the statistics. Email marketing could be the missing piece of your sales target jigsaw puzzle.